I wrote a long ranty post and deleted it. Some things are better left unsaid. So, I am going to rant just a little, wee bit. I will tell you why I hate Ching Ming. I don’t want Koko Krunch and Smarties nor abalone and XO. Heaven must have better foods than that. 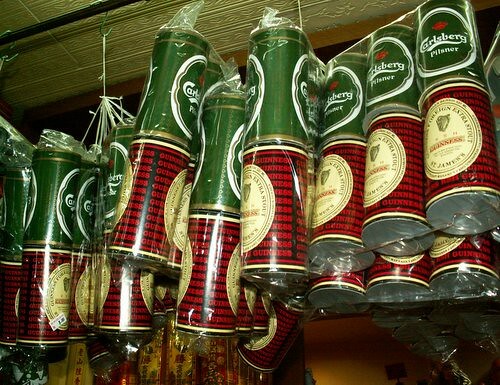 I want to get high naturally without beer and ohkau (stout). Ah Pek, I ‘chia’ you one ohkau, want anot? And most of all, this. This piece of thing almost caused me to break down yesterday. But I took a deep breath and fark every old thoughts. Fark fark fark. Once you are dead, you are with God. Zoom there and no one is sick nor old nor small nor anything. In case you can’t see it well, it is a packet of paper clothes for children, a small one. 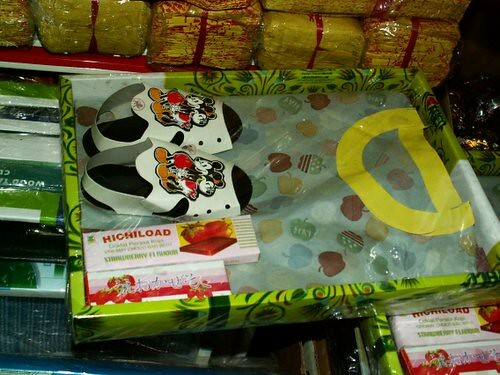 A pair of mickey mouse toddler shoe and some candies. Fark whoever has the idea to do this to those parents whose children had died. May their lampah (testicles) shrink and leave no descendants. This is the cruelest thing to do to a grieving parent. That they have to constantly provide for their dead children and those children never grow up. I am so, so glad that I am in Christ. I do not have to be burdened with these stupid idea that we, the living are responsible for the dead. My Christian belief is they are in a better world, in a form like the blossoming trees (said so in Revealation) and that life there is like eternal spring. There are no pain, no sufferings from those relationship problems. Jesus said so in the Bible to the people who asked him about the woman with seven husbands. 🙂 Zig Ziglar also wrote about this in his book ‘Confession of a grieving Christian’. My ever eager sister-in-law asked my atm to buy a pair of roasted duck and roasted chicken for their grandpa/great-granpa Ching Ming tomorrow. Atm knew I am going to force feed him leftovers (muahahahar) so he said no need. Sis said then buy a big bak pau (meat dumpling). Heh, I teh until he dropped the idea and grumbled that graves as old as theirs don’t need to eat bak pau anymore. I feel like shoving a bak pau into the mouth of whoever with these kind of ideas. Hence, my censored post. And I seriously need to reflect on my own actions and feelings. Hope God forgives me and release those deep anger in me. 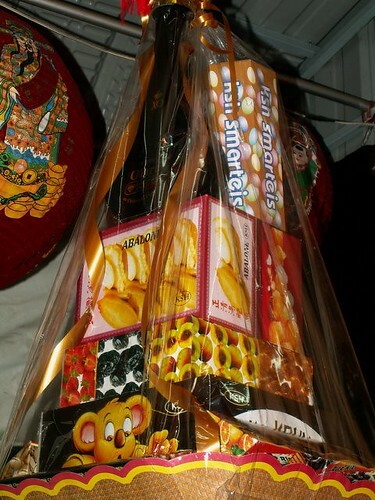 Sorry la, I purposely refused to buy chrysanthemum because I don’t want my sils to think that I am praying to the dead. I bought some purple carnations instead. I purposely want to buy packham pears because I know they don’t like to idea of ‘pear’ which sounds like rake in Hokkien. (raking the properties to my side). I even refused to help my atm to buy the fruits and kuehs (cakes) nor arrange them in the tiffin because I told him, “Hoi!!!! Cannot, later Jesus knock my head, I scared….” But seriously, in principle, I do not want to be reminded that we are responsible for the dead. Because it would means, I have a son out there, waiting for me to feed him. Lawyers and doctors also belong to this category hor? I am like you Auntie Lilian, I can never understand the idea of burning paraphenalia for the dead during Qing Ming festival or when a person dies. However, I respect the beliefs of the taoists and let them burn whatever they want to burn. Afterall, their idea of burning these things for the dead to apease them is more like consoling the living that the dead has all the worldly things and is in a comfortable place. Not everyone can be like us Auntie, not everyone can envision a place like Heaven, so beautiful so pure. So this is the only way for those who can’t imagine it. Thus, I think it is best not to undo the beliefs or publicly display such a post on your blog because I am afraid it might offend certain people. This ritual, is it a cultural thing or a religion thing? I am guessing it’s somewhere in between, since it was passed down from generation to generation. BTW, It’s your blog, do whatever you want. If anyone give you lips, tell them to shove it where the sun don’t shine. what? is it ching ming already? haih..i don’t even know when! My family… we just bring flowers & we pray. I actually go twice a year…2nd visit is on All Souls’ Day on 2nd Nov.
Wuching: It’s on 5th April. Seems like you have SIL from “hell”. Take pictures, take pictures. My dad is interned here in Canada and we pop in to visit whenever we feel like it but I refuse to go at Ching Ming cos from childhood experience it was more like everyone was forced to go. when i kong kah kiaw that time, i wanna to buried with it. so when i walk down the yellow path and cross the yellow river that time, i can get high high. when i met his majesty, the king of hades, i will sing him a poetry and he will forgive all my sins and send me to be reincarnated as bill gate’s son. ayo, auntie, i pity ur atm lah…got stuck in between u and his sisters. This time i have to say, “You are wrong”. Go cook some nice nice food and feed him good. aiyah…the fake teeth gives me the creep…I don’t buy this kinda of staff also…for ching Ming..
soohk – LOL, it really is creepy. Did you see the tongue cleaner too? ahpek – Wuah, you got your path well charted. romantic – I just returned from climbing up the hill into a little jungle and got stung by mozzies. But it is still fun cos I chosed to rough it out. cocka – Oh yeah, they need lots of lawyers there. LOL. Just out of curiousity, any idea how much does the dozen of ohkau cost har?? Looks real lar! helen – LOL, you wanna belanja AhPek? Usually all these small stuffs are about RM2-5. I think this is about RM3. cherry, i think it’s entirely up to auntie lilian to blog whatever that she wants. 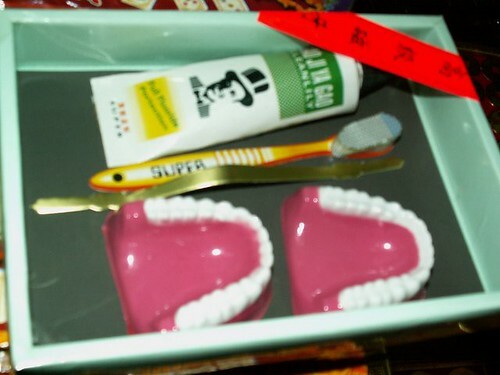 Too bad, looking at the denture and toothpaste, I think dentist all went to heaven. Looking at those stuff, I think HELL(tm) need some recycle plan.